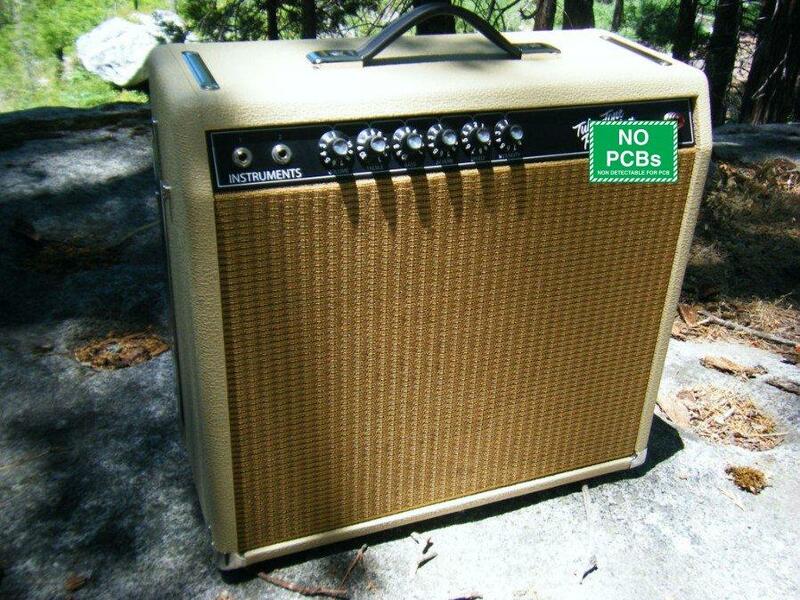 Tube-Tone Prince-Ten is a replica of the 60's F____ Princeton Reverb AA1164. This is 14 watts RMS with two JJ 6V6 power tubes. Classic tone from the 10" Weber 10F125 speaker. Model pictured was done in vintage blond with wheat grill cloth but normally comes in black tolex covering with silver grill cloth. Covering options are shown on the "Coverings" page. Fender Tilt-back legs shown are added option. Circuit is the George Kauffman/Leo Fender's AA1164 Princeton Reverb with added standby switch. Deposit for Tube-Tone Prince-Ten amplifier. Total price is $1360 with free ground shipping in continental US, or $1300 +shipping to other destinations. Please inquire on our discounted FedEx and GLS shipping price. Specify cover and grill cloth, pilot light color, 120v or 230v. California residents, sales tax is added.